In the heart of Leeds city centre this uninteresting outdoor space was in need of invigorating. The aim was to create a smart and stylish roof terrace to suit urban living. We began by fully decking the area with a recycled, plastic composite deck. We added splashes of colour and points of interest with a collection of vibrant pots of varying heights and sizes. Using low maintenance plants which can contend with the strong winds of Leeds, we brought some greenery to this inner-city environment. Stylish furniture and a generous built in seating area have helped to transform this balcony into a chic extension of the home. The combination of pastel green walls and bold planters are a welcome contrast to the monochrome cityscape surrounding. 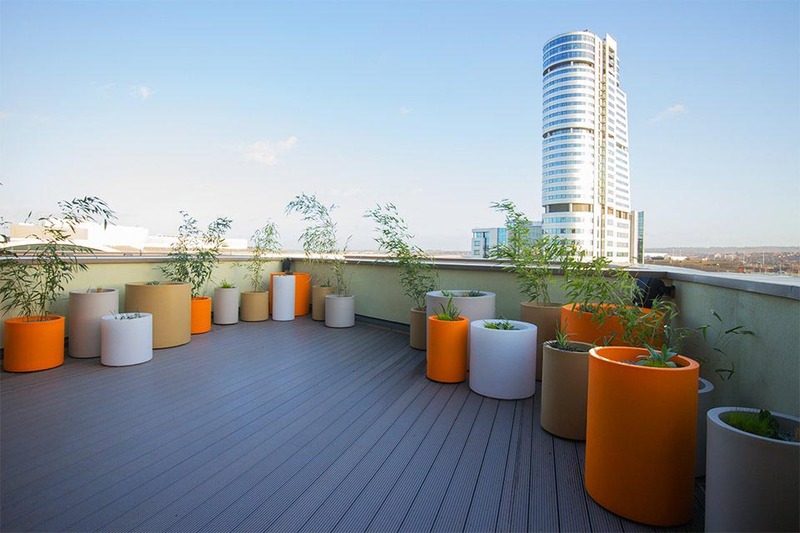 The final result is a contemporary and bold rooftop garden, set within a bustling city centre. With stunning views of the Liverpool canal, this roof terrace is now the perfect place for urban dwellers to relax and entertain.